September is an odd time at the box office. For the most part, studios tend to essentially take the month off from major releases while the American public is largely distracted by the end of summer and the beginning of yet another school year. October is all about horror and by the time November rolls around we're already talking about Oscar contenders, but there's nary a big budget franchise nor a prestige title to be found in the coming weeks. That's not to say that there's no reason to go to the theater. In fact, there is a slew of really fascinating films that will have limited releases in the coming weeks, stuff like The Congress, Wolfcop, The Guest, Wetlands, Zero Theorem, The One I Love and James Gandolfini's final film The Drop from Bullhead director Michael Roskam. These are movies that will require just a little bit of extra effort to seek out and they might not all be home runs, but I can guarantee you that none of them will be boring. I for one am pretty damn excited. But because that stuff isn't going to reach a super wide audience, that makes it less than ideal material for podcasting purposes. Therefore, while I'm hoping to talk about a lot of these more peculiar films, we'll also be pairing them up with some older, more familiar titles for your listening pleasure. Episode 29 is actually a double feature of classic titles starting with Ghostbusters, which has been newly restored and back in theaters this week in celebration of the film's 30th anniversary. (If you missed your chance to see it on the big screen, you can pick up both films on 4K Blu-ray in two weeks.) 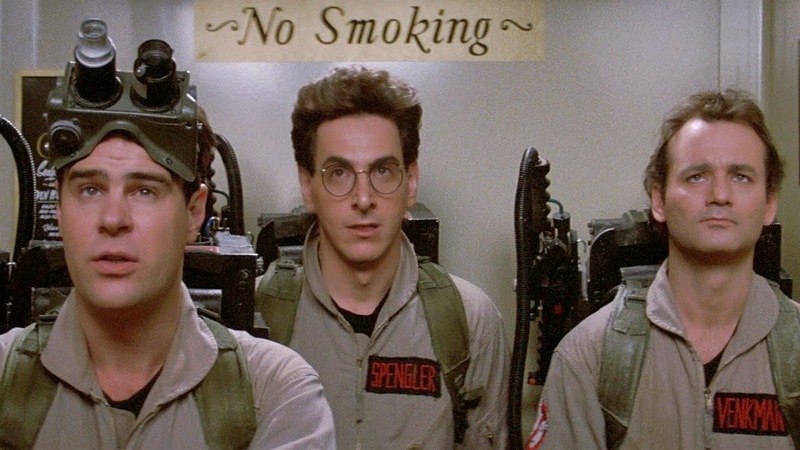 Ghostbusters is our favorite movie of all time so we try not to gush over the film too much. We even swap our own personal ghost stories! We also talk The Birdcage, a movie I've never been particularly fond of and which I don't think I'd seen since the 90's. While a lot of my initial problems with the film seem exacerbated by the passage of time (some of this stuff is the gay equivalent of the laughing Sambo) there are enough moments of brutal honesty and sincere emotional connection to even out the proceedings. I can certainly appreciate why this was the movie a lot of people turned to in the wake of Robin Williams' death. I wish we had talked about this, but I think it's very telling that most of the political stuff which played as broad parody in 1996 is now simply accepted reality. The conservative senator and leader of the morality coalition is found dead in the arms of an underage black prostitute? That's a headline which would barely raise an eyebrow these days. We also chat about the supposed "No Jokes" edict in place for DC's superhero films, Marvel's continued pursuit of Joaquin Phoenix to play Dr. Strange and some of the festival films that have us most excited, including Birdman and Rosewater.